Hello my fellow crystal lovers!! Welcome to the online resource to help you navigate the basics of using crystals for meditation and manifestation! This page contains the essential info on the main crystals I use in many of my kits, along with other resources for you to use as you explore on your own! There are SO many different websites that can tell you the ins and outs of the different crystals and stones out there--in fact, almost as many websites as there are different TYPES of crystals. 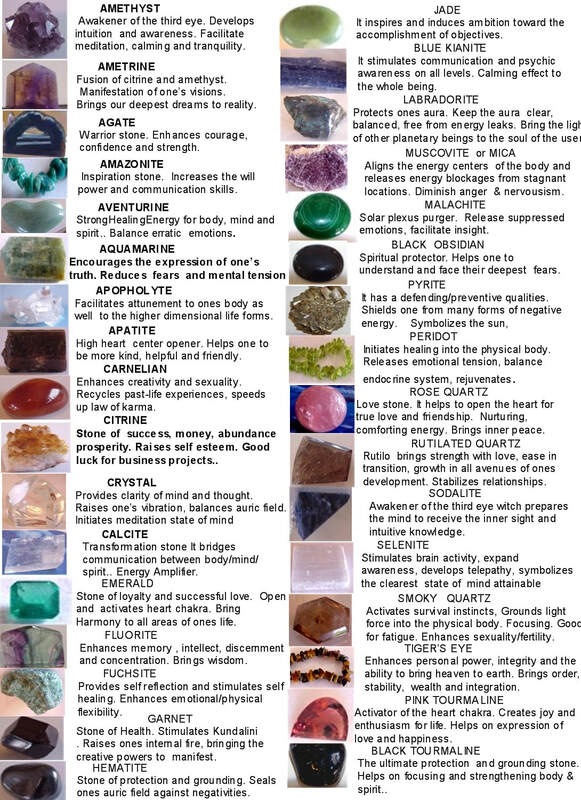 Two of my favorites, and the ones I reference the most below, are crystaldictionary.com (which is super comprehensive), and .the amazing chart from crystals-gems.com. It's a great one to print and bring with you to your favorite metaphysical store so you can browse and pick the ones that speak to you! So What's All the Fuss About Crystals? Let's first define "Crystals". Crystals, like everything on the planet, are an organized grouping of atoms or molecules that take on a characteristic shape, color, and property. Crystals can take the form of everything from salt and sugar, to carbon which appears as everything from pencil lead to diamonds. Each different crystal vibrates at a different frequency when an electric current is passed through it, which means some can be used for really science-y, practical purposes: The original radios were created using vibrating crystals to create the frequency to transmit signals! A quartz clock uses the vibration of a quartz crystal to tell time. Crystals radiate energy in a very consistent and concentrated way. As human beings, we are easily energetically-influenced, partly due to our emotions & partly due to our mainly non-crystalline structure. Unlike crystals, our body’s vibrations can move out of its dominant oscillatory rate (DOR) so very easily when we experience any type of stress. You may have heard the phrase "Raise your Vibration" or "Your Vibe Attracts Your Tribe"...well humans vibration can be thrown off SUPER easily, while crystals are much more stable. When you surround yourself with the energetic vibrations of certain crystals, you begin to experience sympathetic resonance, and each type of crystal influences your frequency in a different way. How Do I Charge My Crystals? Crystals must be charge balanced. This means that the amount of negative charge must be compensated by the same amount of positive charge. Well that's the Science-y explanation. The simpler explanation is that the more you (or someone else) has been holding and using a crystal, the more it needs to be returned to its original energy level. From a purely spiritual perspective, I also like to charge them with intention as well, and tend to use the Sun and Moon method to charge my stones. It all becomes part of the ritual! With all methods of charging, first set your intention and state silently or aloud that you are doing this to charge your crystal for the best and highest good of all concerned. After your stone is charged, thank the Divine by whatever name you know it for assisting in charging your stone. Sunlight or Moonlight Method: The sun’s and moon’s rays are very energizing, as well as energetically clearing. You can use this method to both clear and charge your crystals at the same time. Find a safe place and leave your crystal for 24 hours or more (up to a week) in sunlight and/or moonlight. Some crystals colors will fade in Sunlight, so those should be charged only in moonlight. Some stones that will fade in the sun are amethyst, celestite, kunzite, opal and turquoise. If you have any doubts at all, only use moonlight charging. This can also clear the stones of unwanted energies at the same time if you set your intent to do that as well. What Do I DO With The Crystal Now That I Have It? Now that you have your crystals and you've charged them, it's time to USE them! As mentioned, each crystal emits a certain frequency, so the first step is figuring out which one(s) resonate for you. There are a few methods to do this, 1) Refer to the charts below for common uses, 2) Go to a metaphysical or crystal shop and browse. See where you are drawn and hold different crystals to get a feel for them. This website contains information about crystals and gemstones. The information is not medical advice, and should not be treated as such. Any use of crystals or the recommendation of their use is anecdotal and for entertainment purposes only.